In stock -This product will ship today if ordered within the next 14 hours and 42 minutes. 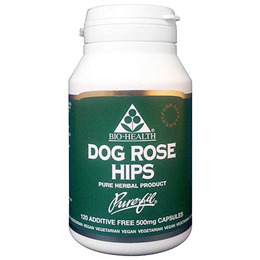 These quality Dog rose hips from Bio Health provide high amounts of vitamin C and bioflavonoids. Dog rose hips also contain high amounts of vitamin C, with 10 to 50 times that of an orange. *The Dog Rose Hips used in this product comply with the standard set by the British Pharmacopoeia. Dog Rose Hips - capsule: Vegetable hypromellose (HPMC). Below are reviews of Dog Rose Hips - Rosa Canina - 120 x 500mg Vegicaps by bodykind customers. If you have tried this product we'd love to hear what you think so please leave a review.